For many people, everyday activities such as using a telephone requires little thought or effort. However, for anybody with hearing difficulties or reduced dexterity it can be a difficult task. 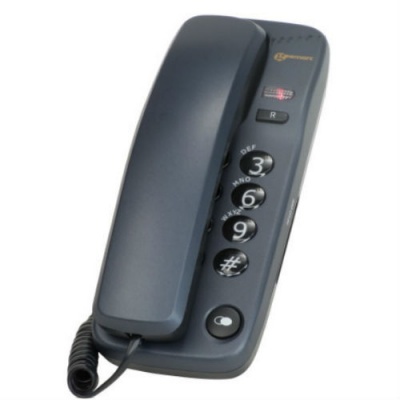 The Geemarc Blue Marbella Corded Telephone is designed to ease some of the stresses of telephone use. With a larger button design, the Marbella Corded Telephone will be useful for anybody with reduced dexterity or difficulties reading smaller numbers. This will help to reduce the risk of numbers being incorrectly dialled and generally make the experience of using the telephone less stressful. For those with hearing impairments, the visual ringer indicator can provide a prompt in the form of a light whenever the phone rings. This will be useful for anybody who would struggle to hear the phone ringing and would prefer to rely on a visual aid. With both last number redial and time break recall, the Marbella Corded Telephone makes receiving and making phone calls much more straightforward. It also features a mute button, meaning it can be silenced during times when you do not wish to be disturbed. The Marbella Corded Telephone can also be mounted to a wall so it will always be in one fixed place and impossible to misplace. It doesn't require a power socket, and can easily be plugged into any phone connection. As the phone is corded, it also means that the receiver will not stray from the main base. This fixed positioning will be practical for anybody with memory issues, dementia or a tendency to become confused or flustered when the phone rings.